The need to relocate is always a great challenge. Either you’re relocating because of your small space or maybe you want a much bigger earn, you surely want to take the risk. So, learn the ways to do a successful office relocation Sydney and do an office move like you’ve done it before! Now, when you go online, you will find plenty of advice about office relocation and how to do it correctly. And there is no telling which of them are not legitimate. But that is not really the big question that you want to ask. The real question is, which of them would work best for you? First of all, it’s your company that you are moving and no one else knows exactly what your needs are, but you. So, try and go over this article and see if these pieces of advice are what you need. We make it a point to pinpoint the most personalised insights and listed them all down right here. The process itself is case to case. There is no standard scenario or whatnot. You need to assess your scenario and identify the facts that you think is unique for your case. For example, if it’s your first time relocating your office, or if a huge percentage of possessions that are to be moved are electronic equipment, then, you mostly require server relocations. This should be clearly explained so that in case you are not aware of the jargon, you can be guided properly and correctly. And so you can get the support that you need as you are preparing for business relocation. Put all these requirements on a list before you contact your office movers Sydney company. It’s a simple cause and effect. If you communicate with your service provider effectively, then you get the guarantee of successful office relocation Sydney. This should be straightforward enough for you. As you are a business person yourself, surely you appreciate it better if your customer would tell you their needs right on and comprehensively. Familiarity is also a key to a successful office relocation Sydney. As much as these people from the moving company are experts in what they do, your people are experts in everything about your workplace. Hence, it would be even better if some of your own people will take part in the move. So, in this way, they can assist in the process when they can. That’s right. It’s better to get things rolling early on. And that also means that the removal should not be done in a single day. Move in a structured and well-organised system. Identify the things that you can move first as well as the next batch to move and so on. Starting the move early also gives the team enough leeway for adjustments. For instance, if ever the team will catch a bad weather, they can postpone moving a batch of your belongings. In this way, you can also allow you to set a portion of your business operating while in the process of moving. Smart allotment of the budget is another crucial factor to your successful office relocation Sydney. This part is the reason why you have to identify your needs as a client first. As a result, your financial team can also make a realistic prediction of your expenses. Especially if you will require extra solutions such as a business storage Sydney. Well, this should be an obvious yet all the same important tip. You need to choose your service provider wisely. Gather as much information that you can find for your reference and leverage. Looking is not very difficult when you know what you are looking for. The best business relocation services provider is just waiting for you to reach out. Moving an entire company regardless if it is small or big is not an easy task. In fact, the key is knowing what you have to do for a successful office relocation Sydney. And now that you’ve learnt the best practices. It’s now time for you to take them into action. Get started on your relocation today and be sure to follow these simple steps. Do you want to get started with your successful office relocation Sydney now? Then contact the best company that can get you through this seamlessly. Business Relocation Services is your number one provider and partner in this endeavour. Let’s talk about your move today! Unsure whether you are planning it right? 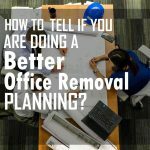 Then read the signs that you are doing a better office removals planning now!